NATIONAL PLOUGHING CHAMPIONSHIPS, Europe’s Largest Outdoor Exhibition and Agricultural Trade Show was the most successful Championships ever with over 281,000 in attendance and 1,500 satisfied exhibitors.The National Ploughing Championships takes place each year in the month of September. The 2018 Championships will be held at Screggan, Tullamore, Co Offaly from September 18th – 20th 2018. 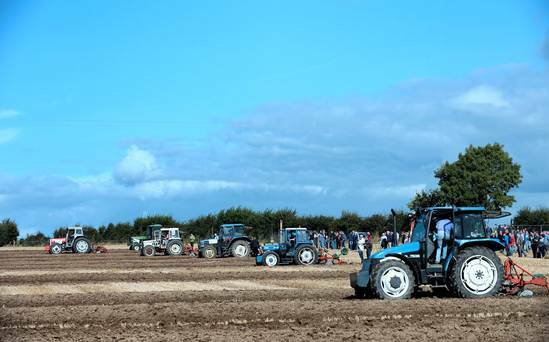 The first inter- county ploughing contest took place in 1931 as a result of an argument between two lifelong friends, Denis Allen of Gorey, County Wexford and JJ Bergin of Athy, County Kildare. Each argued that their respective counties had the best ploughmen. This resulted in a challenge being called for. Therefore on Monday 16th of February 1933, the first National Ploughing contest took place in Mr W.K. Hosie’s field at Coursetown in Athy. Since then, the National Ploughing Championships has grown in size, year on year. It has expanded from requiring a small field of 26 acres to needing over 700 acres of land today. Within this, the site now requires 180 acres for ploughing, 80 acres for trade stands and exhibition space, 400 acres of car parking and a demonstration area of approximatrely 25 acres. 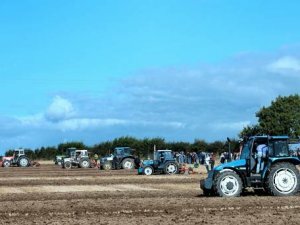 Since its inception, the National Ploughing Championships has become much more than just an annual inter-county competition; it has become an intrinsic part of Irish rural life. Our tour will depart from Cookstown very early Tuesday morning with pickups enroute to Armagh at 6am and onward to Co Offaly expecting to arrive the site by 9.30am. Then at 5pm we depart to Naas for overnight on Dinner Bed & Early Breakfast departing the hotel by 7.30am for return to Tullamore for a second full day at the Championship before leaving for Northern Ireland with dinner enroute and back to your setdown point. The National Championships is now no longer just for ploughing or machinery enthusiasts, the modern event now features something for just about every member of the community. These include a Tented Trade Village, a Food Fair, Craft Village, Livestock, Forestry, Education, Lifestyle, Motor Show, Financial Services, Bio Energy and Agri Service. Along with this, there are many entertainment and special events taking place. Some of these include: Fashion Shows, Celebrity Guests, Sheep Dog Trials, Loy Digging, All Ireland Lamb Shearing, Most Appropriately Dressed Lady & Gent Competitions, Craft Demonstrations, Meggers, Celebrity Cookery Demonstrations, Outdoor Radio Broadcasts and much more. With all this happening, the yearly Championships usually attracts in excess of 1,100 exhibitors and up to 190,000 visitors. Tour Leaders: Mervyn and Sharon Smyth. * Luxury coaching from pickups in Northern Ireland. * 1 Night Half Board in 4****Court Yard Hotel Leixlip. * Admission to Championships on Wednesday & Thursday. * Evening meal in Canal Court Hotel Newry on Thursday. * Services of Huttons tour leader during this 2-day agri tour.